The Angriest: Star Trek: Deep Space Nine: "Apocalypse Rising"
It is 30 September 1996, and time for the Season 5 premiere of Star Trek: Deep Space Nine. With Odo (Rene Auberjonois) confirming that Klingon Chancellor Gowron (Robert O'Reilly) is a changeling, he, Sisko (Avery Brooks), Worf (Michael Dorn) and O'Brien (Colm Meaney) head on a top secret mission to the heart of the Klingon Empire to reveal the infiltrator and potentially stop the Klingon-Federation War. "Apocalypse Rising" is a high concept blockbuster of an episode - in its ideal sense, at least - and brings back Deep Space Nine for its fifth year in an energetic fashion. In practice it doesn't quite work as well as it should on paper, almost as if the production team elected to pull their punches. I have never managed to quit work out why. Back when Season 4 was getting developed, Paramount was unhappy with Deep Space Nine's viewing figures and instructed its producers to shake the series up somehow. 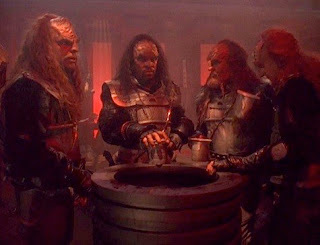 Their solution was to bring in Michael Dorn as Commander Worf and develop a war between the Federation and the Klingon Empire - one secretly manipulated into existence by rival empire the Dominion. It certainly gave Season 4 a degree of popcorn entertainment, but it partially derailed the series' overall storyline. The series had spent three years tracking two main arcs: the growing threat of war with the Dominion, and Sisko's gradually increasing involvement with the religious affairs of the planet Bajor. Klingon battles was entertaining enough, but it never quite felt like what the series was supposed to be about. "Apocalypse Rising" tries to resolve that to a large extent: it ends active war with the Klingons without making it seem like the last year was a waste of time, and it ties it all back very neatly into the Dominion threat. It makes for a very slightly clunky episode, but it mostly gets away with it. Where the episode disappoints is in its scale. It feels like it should have been two episodes long, with room given to develop the threat and build the tension. What is undertaken here is good - and seeing the non-Klingon members of the cast in make-up is a hoot - but just as it feels like there's a larger story to tell everything gets wrapped up in a rush. Robert O'Reilly remains an eye-bulging joy as Gowron. J.G. Hertzler owns his craggy, grizzled performance as General Martok. The regular cast do wonderfully, although poor Colm Meaney is visibly in agony under all of that prosthetic make-up. It's just smaller and shorter than it needs to be: simultaneously entertaining and disappointing. It's also a shame that nobody thought to bring one of the female cast along on the mission: you've have though Klingon expert Jadzia Dax (Terry O'Farrell) in disguise would be a no-brainer. Still, it's good enough to get the thumbs-up. Season 5 kicks off with a quality ratio of 100 per cent; let's see how many episodes in a row it can keep that faultless ratio in position.